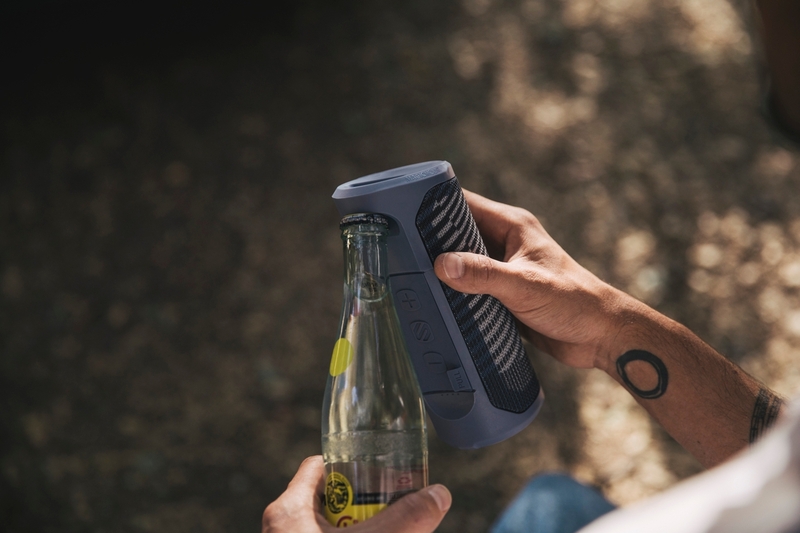 Scosche has announced the availability of its new BoomBottle MM rugged waterproof wireless speaker. Originally announced at CES 2018 in January, BoomBottle MM is a sequel to Scosche’s 2015 BoomBottle+, featuring two six-watt speakers and two 40 millimeter passive radiators. Like its predecessor, BoomBottle MM is IP67 rated for both dust and water protection, but the new model also features Scosche’s MagicMOUNT technology to allow users to keep their iPhone magnetically secured to the speaker, along with a magnet on the bottom of the speaker that lets it be attached to just about any metal surface at just about angle, and there’s even a built-in bottle opener. An auto-sensing indoor/outdoor equalizer also automatically adjusts sound quality appropriate to where you’re using the speaker, and two BoomBottle MM speakers can be paired for better stereo separation. The black BoomBottle MM is available now at Costco.com and select Costco retail locations, and the full color range will be available directly from Scosche and other retailers starting in June for $129.99.